AMD has been the subject of acquisition speculations, more often than not in the past and with yesterday's joint presentation with tech giant Oracle, many will wonder whether now isn't the right time for the Austin-based company to start looking for potential suitors. To borrow one of Microsoft's favourite terms, AMD is now at a "threshold" in its journey as a company. It's being gradually pushed out by Intel from a shrinking x86 desktop market and its mobile/tablet products are barely registering anywhere. Standalone graphics cards (or add-in boards) are still big business, but they are steadily shrinking as embedded graphics solutions now provide plenty of oomph for the average computer user. AMD's GPU shipments in Q2 jumped by 11% according to analyst Jon Peddie but it cannot mask a long term decline in that particular market; desktop GPU shipment units peaked in 2011 and have shrunk by nearly 20% since then. That leaves AMD in a precarious position with its server business unit being the only real, sustainable area of growth for the next few years. I recently wrote about why Qualcomm could potentially buy AMD to give it a head start in the ARM server market but Oracle could very well be another suitor. It won't be the first time both companies are linked; in 2010 and 2011, rumours emerged that a deal might be on the table. Time has changed since then; the company has lost 92% of its value since 2005, 62% since 2010 and lost 4% just yesterday. AMD was worth $2.73 billion at the time of writing (£1.70 billion, AU$ 3.13 billion). At the beginning of this decade, x86 performance was the main driver behind a potential adoption but things have moved on. Yesterday's AMD/Oracle event was about Java's performance on AMD's ARM-based Opteron A-series with a particular focus on application accelerators. AMD is a leader there with years of experience in customising xPU (CPU, GPU, APU) for customers (Samsung, Sony, Microsoft, Nintendo) but it is its experience as a heterogeneous player that could attract Oracle. Put it simply, AMD is the only one in the market that can play well on the strengths of three different architectures: x86, ARM, GPU (Taiwanese firm VIA could also do it but I won't bet money on it). 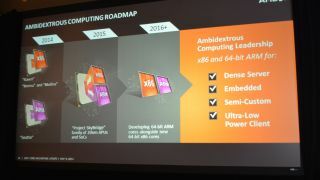 That Skybridge ambidextrous, platform-agnostic design AMD presented earlier this year, could turn up to be very, very enticing. Throw in a sprinkle of heterogeneity and it would all make sense. AMD was one of the founding members of HSA (Heterogeneous System Architecture) in June 2012 together with TI, Imagination, ARM and Mediatek. Oracle and a bunch of other major technology players joined in late 2013 and it is now clear abundantly clear that Oracle could use HSA to offer an even more differentiated product portfolio, one that it controls from end-to-end, hardware, software and services included. Think Apple but for enterprise. Oracle buying AMD would be devastating for enthusiasts and consumers worldwide though, both in the GPU and the CPU markets where Nvidia and Intel would be the only respective major players.